I was at a street fair and saw an Arepas booth. They looked good. The guys at the booth knew nothing about the ingredients and I was wary to try them there, but I did get a hankering for them. 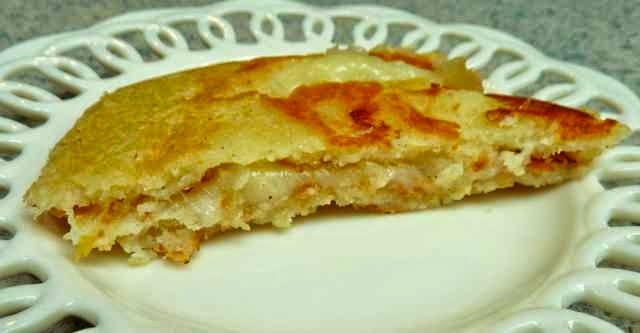 Arepas are corn pancakes most often made with melted cheese sandwiched between two of the pancakes. They are common in many countries in South and Central America and many Caribbean Islands. Some pancakes are sweet and some are not. The recipes are naturally gluten free as long as you use certified gluten free corn flour. I looked on-line for some recipes. 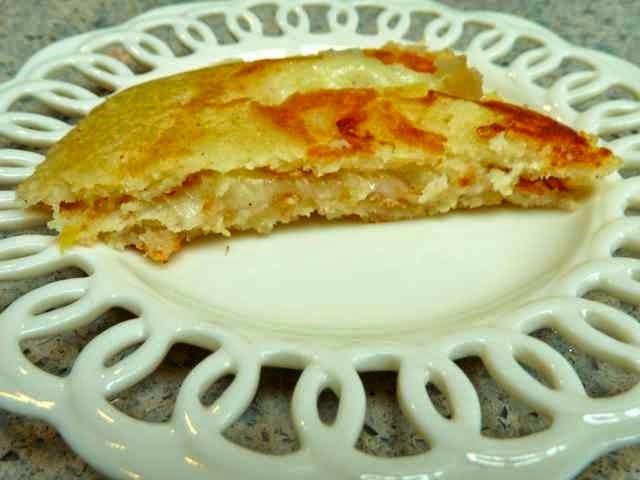 I chose a Cuban sweet arepa recipe that is popular in Miami, Florida. I had some gluten free instant corn masa flour at home for making tortillas. 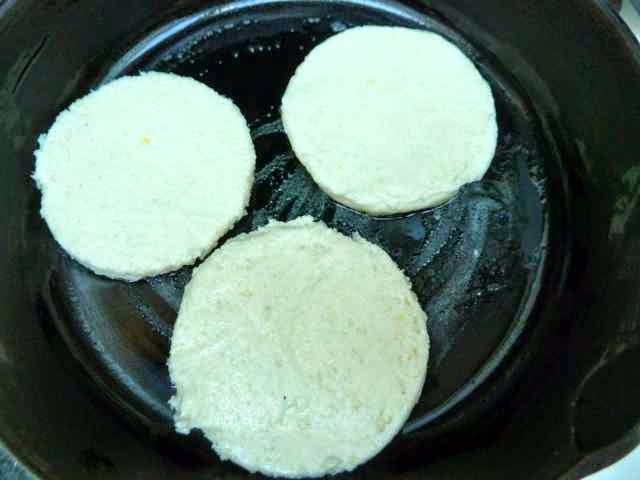 The arepas are supposed to be made with a special finely ground pre cooked corn flour sold as Harina Pan or masarepa. I decided to make them with what I had on hand. The dough was wetter than the dough in the recipe so I adjusted by using wax paper to transfer the pancakes to the pan. I may try to pick up some of the Harina Pan when I can to see if they are easier to work with if the intended arepa flour is used. I loved how they tasted, very delicious. I can see why they are so popular at street fairs. Bring the milk (or non dairy milk) to a boil. Add the butter or oil and set aside. In a large bowl add the arepa flour, salt and sugar. Mix well. Set aside. Grind the corn in a food processor. Add the ground corn to the flour mixture and mix well. 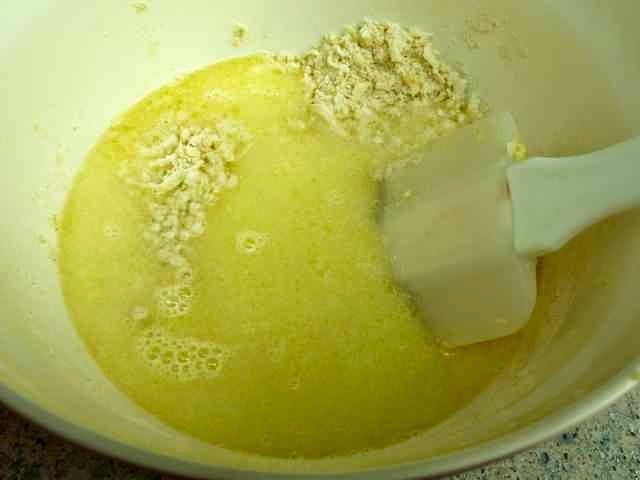 Add the shredded mozzarella cheese (or non dairy cheese) to the flour and corn mixture and combine well. 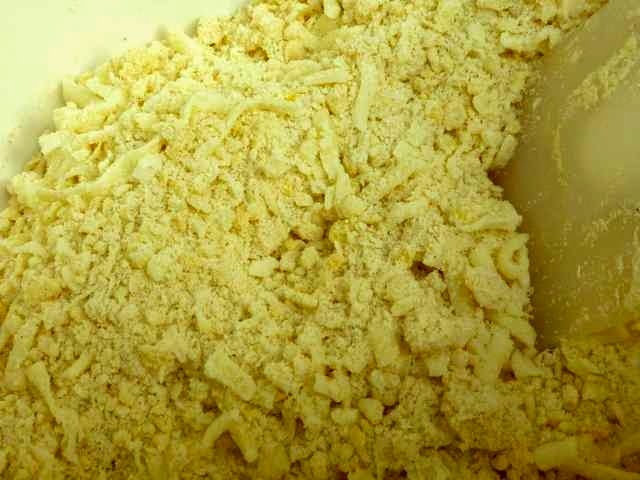 Flour mixture with corn and cheese mixed in. Make a well in the center and pour in the hot milk mixture. Stir until there are no lumps. Milk mixture added to flour mixture. 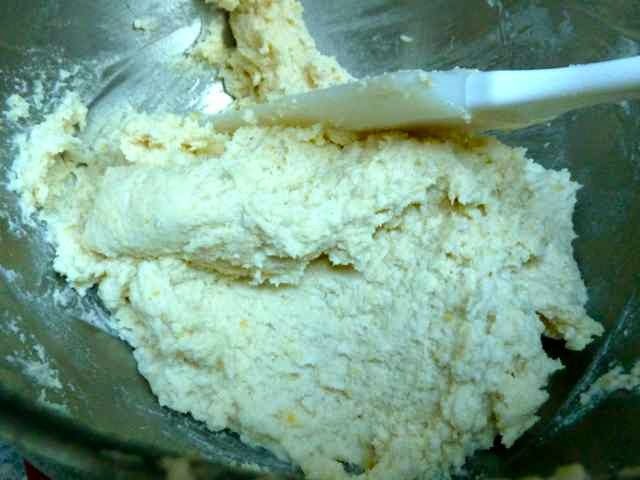 Allow the dough to sit for at least half an hour so that the corn flour can absorb the liquid. To make the pancakes, knead the dough until smooth and sticky adding water as needed if too thick. Roll out the dough between two sheets of wax paper. The dough should be about 1/4 inch thick. Cut out rounds with a 3” cookie cutter. Because I did not use the correct flour my dough was a bit too wet to knead or to roll out. I shaped the pancakes by pressing the dough into the cookie cutter with my hands. My dough was too soft to roll. I pressed the dough into the cookie cutter to shape the pancakes. Raw Arepas on wax paper. Heat a lightly greased griddle or frying pan over medium heat. Cook a few arepas at a time. My dough was wetter than it was supposed to be because I used a different flour. 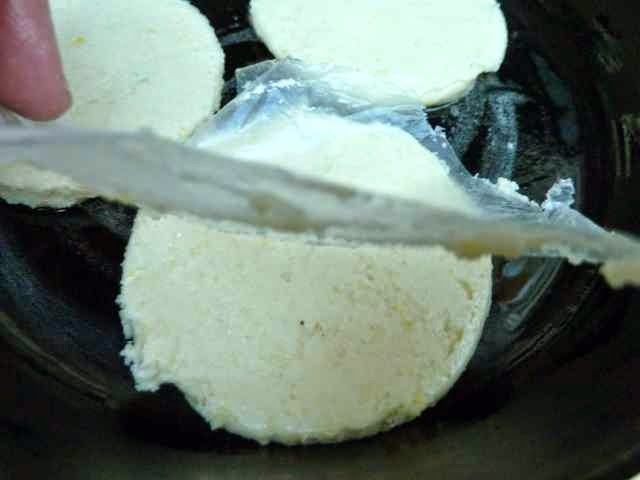 I cut out the wax paper around each pancake and lifted the arepas into the pan with the wax paper. I peeled the wax paper off after placing the arepa in the pan. 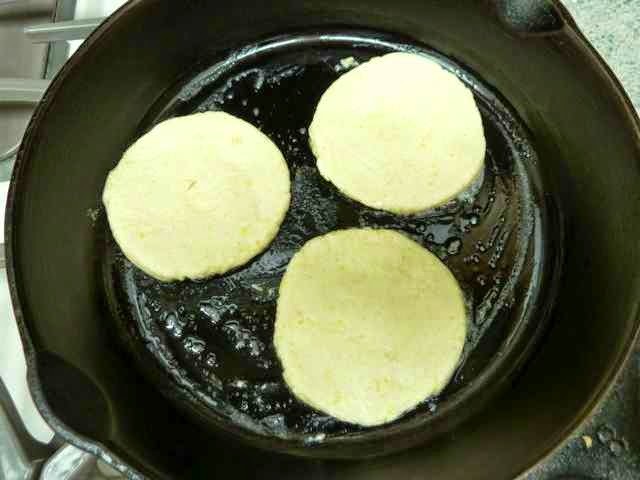 The pancakes or arepas will be crisp and golden brown, firm, slightly dry on top with some bubbles noted when ready to turn over. Do not turn over too soon or it will fall apart. and peeling off the paper after they are in the pan. 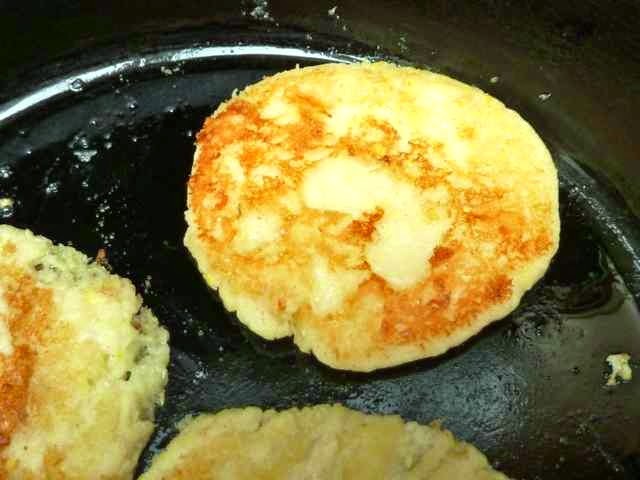 Arepas just put onto a medium heat skillet. After cooking about 2-3 minutes. Note the dry tops. Turn over and cook on the other side. Arepas turned over. One of mine had a heart. This is what happens when the first side is not cooked enough and you turn it over. It looks bad, but tastes really good. Place a slice of cheese on top of one cooked pancake and top with another. Cook until the cheese melts. Remove from the pan and enjoy. Repeat with the other pancakes. On the right is a sandwich cooking until the cheese melts. the top pancake will go on top to complete the other sandwich. SWEET AREPAS Makes 6-8 Ingredients 1 cup Arepa Flour - (I used Instant Corn Masa Flour because I had some at home.) 1/4 tsp. Sea Salt 1/3 cup Sugar 1 cup Frozen Corn Kernes - ground 1 cup Mozzarella Cheese - shredded - for dairy free/vegan use a mild non-dairy cheese 1 cup Milk - for dairy free/vegan use nondairy milk 5 Tbs. Butter - for dairy free/vegan use vegetable oil such as olive or canola 6-8 Slices Mild cheese such as Swiss or Mozzarella - for dairy free/vegan use a mild nondairy cheese Directions Bring the milk (or non dairy milk) to a boil. Add the butter or oil and set aside. In a large bowl add the arepa flour, salt and sugar. Mix well. Set aside. Grind the corn in a food processor. Add the ground corn to the flour mixture and mix well. Add the shredded mozzarella cheese (or non dairy cheese) to the flour and corn mixture and combine well. Make a well in the center and pour in the hot milk mixture. Stir until there are no lumps. 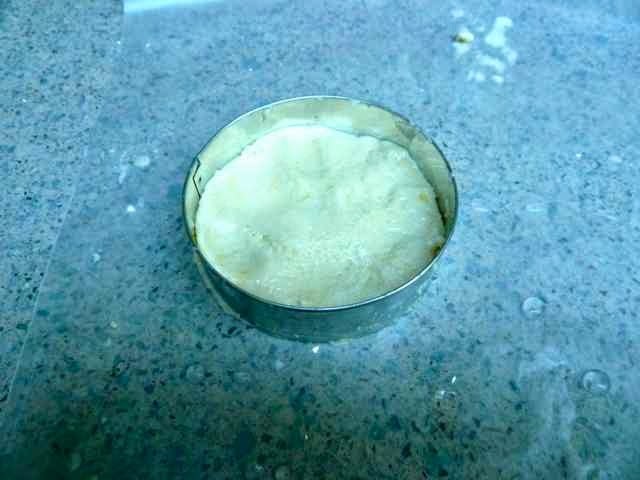 Allow the dough to sit for at least half an hour so that the corn flour can absorb the liquid. To make the pancakes, knead the dough until smooth and sticky adding water as needed if too thick. Roll out the dough between two sheets of wax paper. The dough should be about 1/4 inch thick. 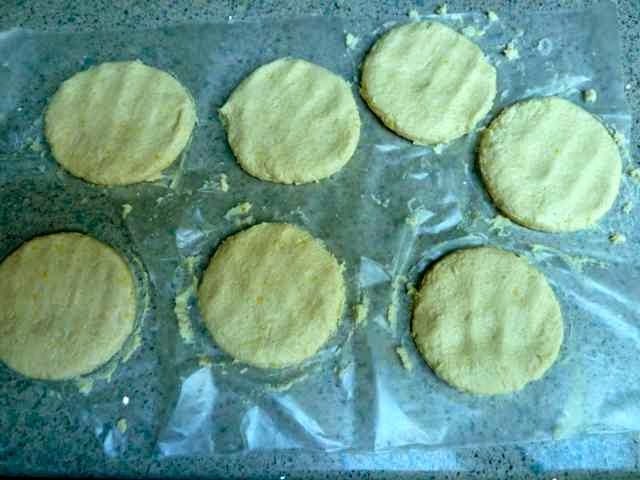 Cut out rounds with a 3” cookie cutter. Because I did not use the correct flour my dough was a bit too wet to knead or to roll out. I shaped the pancakes by pressing the dough into the cookie cutter with my hands. Heat a lightly greased griddle or frying pan over medium heat. Cook a few arepas at a time. My dough was wetter than it was supposed to be because I used a different flour. 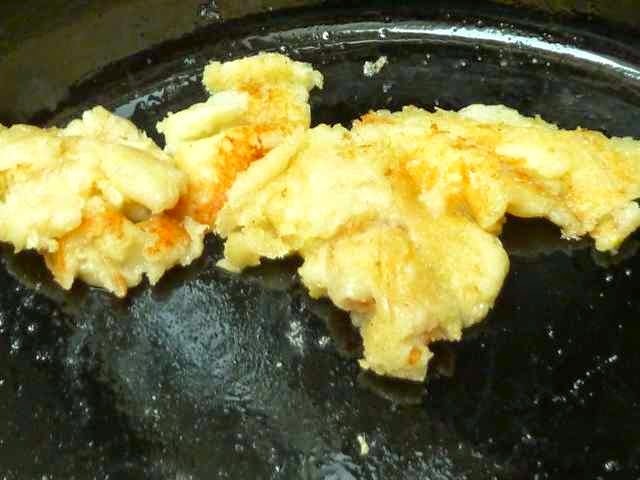 I cut out the wax paper around each pancake and lifted the arepas into the pan with the wax paper. I peeled the wax paper off after placing the arepa in the pan. 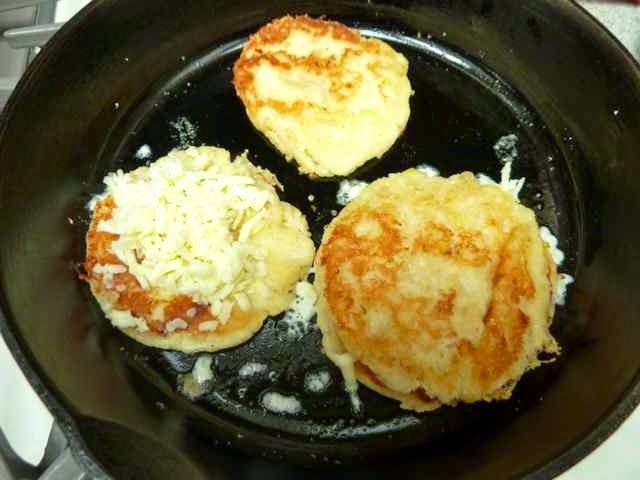 The pancakes or arepas will be crisp and golden brown, firm, slightly dry on top with some bubbles noted when ready to turn over. Do not turn over too soon or it will fall apart. Turn over and cook on the other side. Place a slice of cheese on top of one cooked pancake and top with another. Cook until the cheese melts. Remove from the pan and enjoy. Repeat with the other pancakes.